^ Given her proper title under the 1917 Letters Patent, HRH Princess Louise of Wessex holds no surname; but, when court communications give her a surname in order to refer to her without this royal style, it is Windsor. ^ （英文） Succession. The official website of the British Monarchy. [2011-03-04]. ^ （英文） Royal baby born prematurely. BBC News. 8 November 2003 [11 May 2010]. ^ （英文） Palace releases first baby photos. BBC News. 10 January 2004 [4 March 2011]. 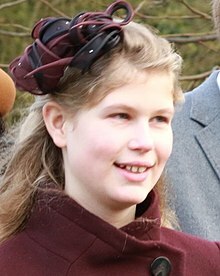 ^ （英文） Announcement of the christening of Lady Louise Windsor. The official website of the British Monarchy. 8 April 2004 [2011-03-04]. ^ （英文） Edward Sophie's brave Lady Louise fairground attraction. London. ^ （英文） Royal wedding: William picks brother Harry as best man. BBC News. 14 February 2011 [4 March 2011]. ^ （英文） Hardman, Robert. The Line of Succession to the British Throne. Monarchy: The Royal Family at Work. Druck, Wemding, Germany: Ebury Press. 2007-11-29: 265. ISBN 978-0-09191-842-2. （英文）BBC News- "Royal baby born prematurely"